In Bulgaria, there is a well-developed telecommunications market as penetration of mobile communications has reached 130%. At the same time, tourism flourishes in the country, with about 9 million foreigners coming to Bulgaria annually (with a population of 7 million). This ensures constant inflows of international voice traffic. Despite the fact that the rate in this direction is $0.01, you can earn money by terminating calls, if you choose a favorable tariff plan. 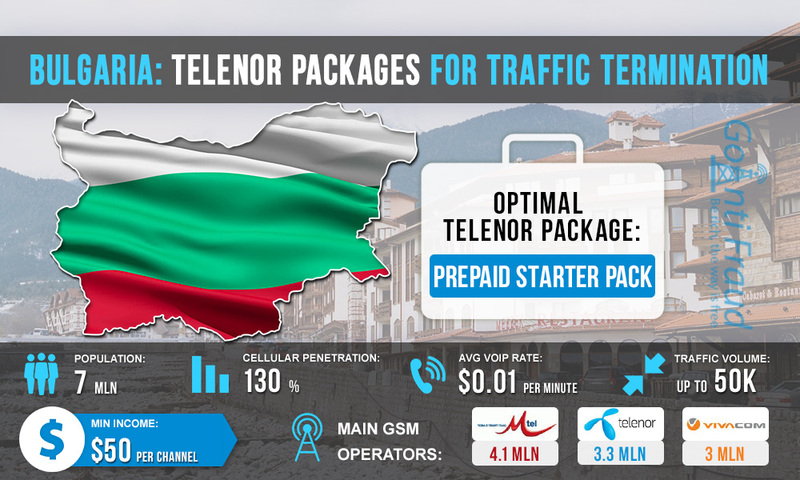 Telenor is the second operator in the Bulgarian market in terms of subscriber base. Its services are used by about 3.3 million people. The operator offers prepaid subscribers 3 starting packages, which are Telenor, Telenor 8 BGN, and Telenor Tourist. The best option is the standard Telenor package. It costs $ 3.4, while you get 100 free minutes for on-net calls and 100 free minutes for calls outside the network. At the same time, $1.7 will be immediately available on your account. Telenor also has a lot of bonus Add-On offers. The most advantageous of them provides 550 free minutes to make calls to Telenor numbers for $5. When you connect bonuses, one minute of the on-net call will cost you $0.009. You also get bonus minutes and additional bonuses when you top up your account. If you top up with over $3.4, you get 100 free minutes. Using Prepaid Telenor you will be able to make $50 from one GSM channel. When converting VoIP to GSM in Bulgaria, you should protect SIM-cards against the operator's anti-fraud systems. Since Telenor is one of the largest cellular companies on the market, it invests considerable funds in the development of analytical systems for tracking termination. By protecting numbers from mass locking, you can make more money.